I watch the bald eagle glide high above the Kitsap Peninsula and hear it’s shrill cry as it swoops down through the pale blue Pacific Northwest sky toward its nest in a tall Douglas fir overlooking Puget Sound. The nesting female raises her white-feathered head as the male pumps its wings, stalls in mid-air, extends powerful legs and alights gently beside her. 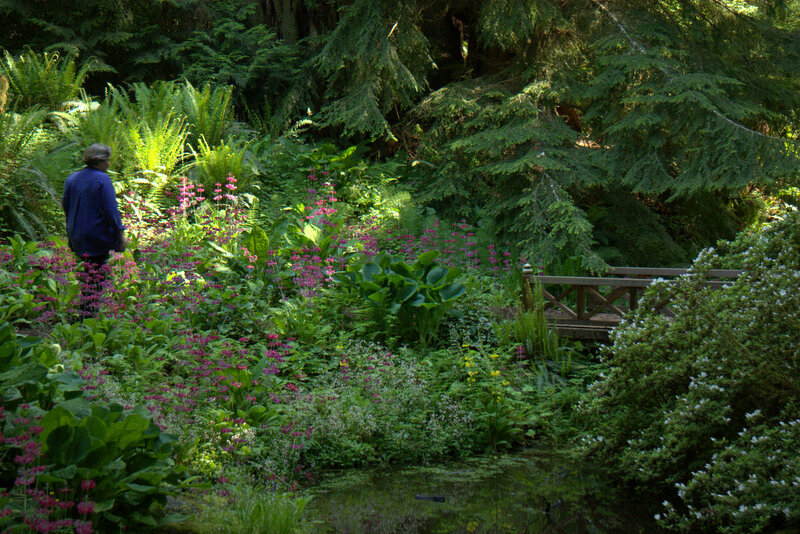 The nest is in the Bloedel Reserve on Bainbridge Island, a brief ferry ride across Puget Sound from Seattle. The 150-hectare estate on a wooded promontory in the island’s north was bequeathed to the public by late timber magnate Prentice Bloedel. The eagles’ nest is visible from the French-style country house that was the Bloedel family home. The library holds a photographic record of the annual nesting of the magnificent birds that are America’s national emblem. First sightings of each new bald eagle chick are religiously observed. In the surrounding gardens I follow a network of groomed paths through second-growth forest to glens filled with magnificent rhododendrons. There are grass meadows, ponds and lakes where Trumpeter swans feed. The reserve also has a formal Japanese garden and mystical moss garden. The ride across Puget Sound to Kitsap, just 35 minutes from downtown Seattle, is aptly branded a journey “just far enough to get away”. Ferries sail regularly between Bainbridge and Seattle’s Pier 52. Pulitzer Prize-winning author Timothy Egan has described riding the ferry towards the Seattle waterfront as “the greatest urban view anywhere in the world”. On fair-weather days the city skyline is etched against a backdrop of Mt Rainier and the Cascade Ranges. The Peninsula is a mix of rural countryside, farms and seaside villages but also has tracts of intact wilderness where black bears rummage through the forest undergrowth. Local wetlands lure migratory birds and birdwatchers each spring and autumn. 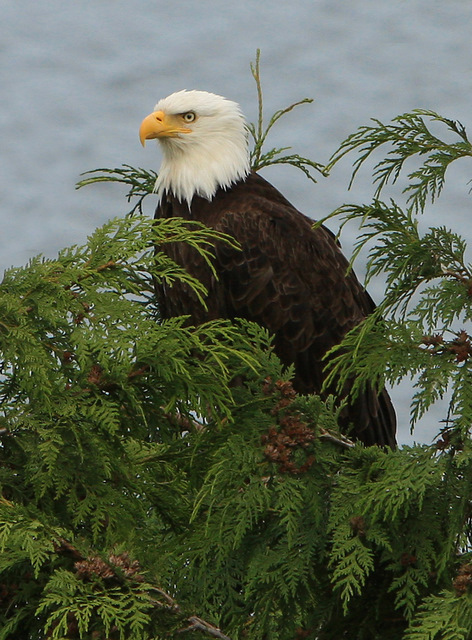 A forest in the far north has the oldest bald eagle’s nest in Washington State. White-tailed deer inhabit the woodland areas and open meadows. Kitsap also has coyotes and raccoons, even cougars and Puget Sound is home to sea lions and harbour seals and visited by orca and humpback whales. That’s Kitsap in an eloquent nutshell. It’s no wonder that so many creative people – writers, artists, sculptors, musicians and others – have been inspired by this inspiring rural tranquility. Fishing and berry farming are both economic mainstays along with island tourism, which in turn is good for the artists and growers. 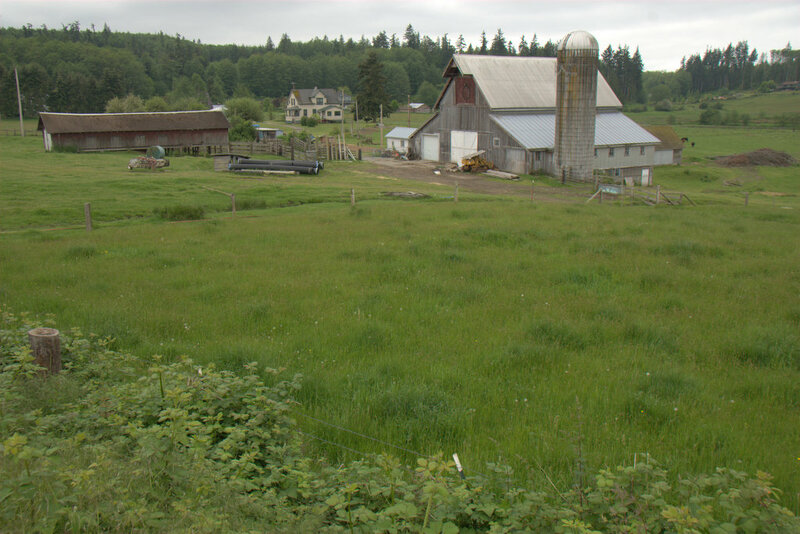 I’m not at all surprised to read that Bainbridge has been ranked among the top spots in the US to live. There are simple cruises and there are voyages of discovery. I’ve never seen the attraction of a cruise to nowhere, the sort than simply sail around for a few days then head back to port. Where’s the adventure in that? I expect a cruise to ship me somewhere marvellous. In this respect, my best ever cruise was on a hard-working cargo ship plying remote parts of the Pacific. There were no luxury cabins, no endless buffets and no excruciating karaoke evenings. Instead, my voyage of a lifetime was aboard “a freighter to paradise”. The Aranui is a copra trader. She regularly departs Papeete in Tahiti on a 14-day round-trip voyage to one of the most remote and beautiful places on Earth – the magical isles of the Marquesas Archipelago, 1400 kilometres north of Tahiti and just 10 degrees south of the Equator. 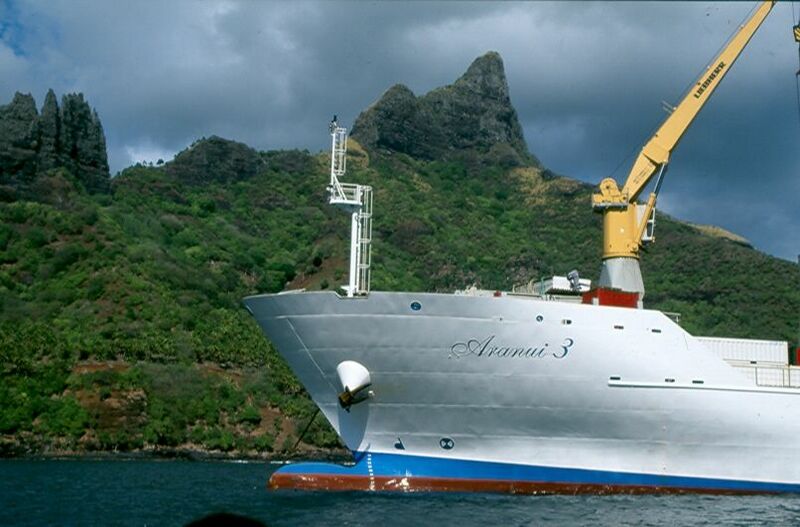 The Aranui 3 can carry a couple of hundred passengers yet it’s primary mission remains the transport of goods, as it has since the first voyage of the Aranui 1 in 1959. She carries tractors, pumps and assorted machinery, building materials, food and drink, medical supplies and other items that are vital to the people living on these far-flung islands . There were 80 passengers on my voyage and that was more than enough. When visiting some villages we outnumbered the locals. 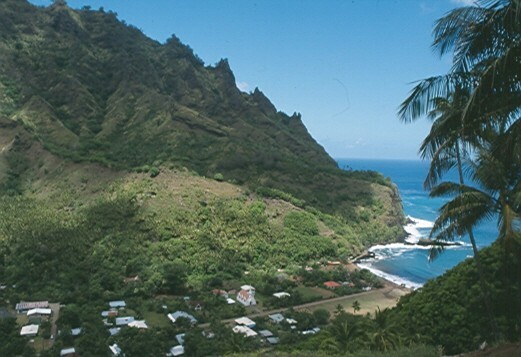 The largest, most populous island is Nuku Hiva and the most remote is Fatu Hiva at the farthest tip of the archipelago. 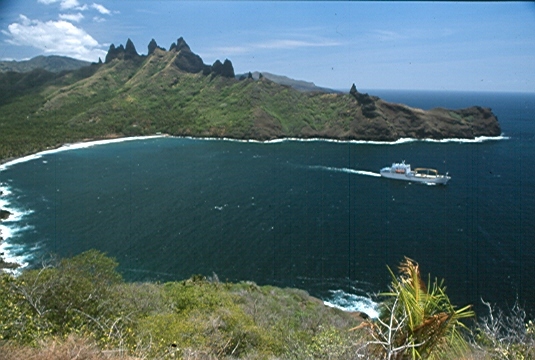 Midway lies Hiva Oa. There are 13 islands altogether, all volcanic, all rising dramatically out of the ocean to reach dizzy heights. Mountain slopes are smothered in vegetation and crowned in weathered needles of black rock. Coastlines are mostly black cliffs battered by waves and washed by treacherous currents. 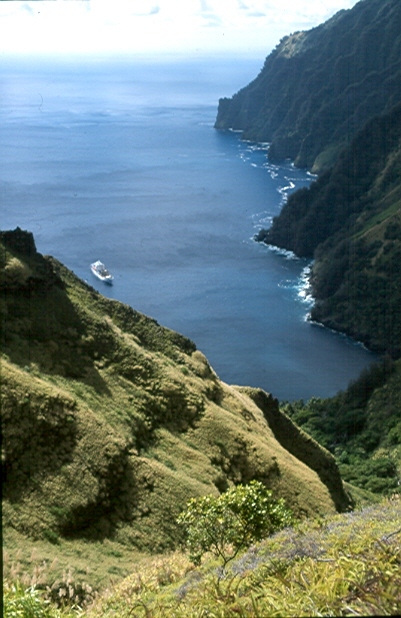 There are few swimming beaches in the Marquesas but lots of splendid natural harbours, deep inlets and glorious bays. The earliest signs of settlement in French Polynesia are found on these islands and excursions included visits to ancient sites of worship called marae. On Nuku Hiva we also visited the modern cathedral in Taiohae, browsed the local market then drove to the Taipivai Valley where, in 1842, author Herman Melville lived for a while and was inspired to later write Typee based on this experience. On Hiva Oa we visited the grave of artist Paul Gauguin who died here in 1903 and is buried under a frangipani tree in Calvary Cemetery on the hill above Atuona village. Belgian chanteur Jaques Brel, who died in 1978, is buried nearby. Most of Aranui’s passengers opted for the 16 km trek across Fatu Hiva, following a ridge-line trail that links the villages of Omoa and Hanavave. It was welcome exercise after days afloat and provided astounding views. That evening we sat with our drinks on the Aranui’s top deck watching a luminous golden sunset over Hanavave, the Bay of Virgins. Hapatoni island is not visited on every voyage. Our arrival caused much celebration and prompted brisk business in carved wooden bowls, sandalwood necklaces and nut pendants. There was singing, dancing and a BBQ. The Aranui pays each village per visit and in some instances supplies food for modest feasts. At other landfalls we ate in local restaurants. The Marquesas menu includes lobster, freshwater shrimps, goat curry and sweet and sour. Aranui: Compagnie Polynesienne de Transporte Maritime, P.O. Box 220, Papeete, Tahiti. One of my favourite areas of London is Little Venice, the meeting point of Regent’s Canal, Paddington Basin and the Paddington Arm of the Grand Union Canal. It’s a lovely neighbourhood with the canal, its bridges, shady trees and patches of green surrounded by elegant town houses. There are several fine ale houses and a small theatre. 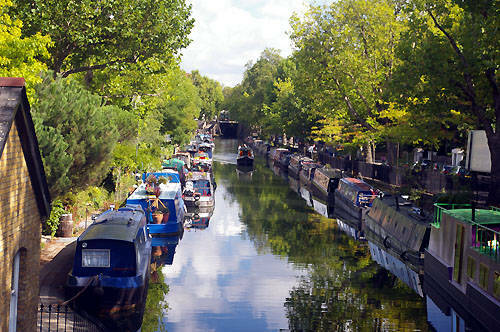 Little Venice is a short walk from the Warwick Avenue tube station. During summer, the canal here hosts small flotillas of brightly painted narrow boats, many of them lovingly detailed with traditional picture landscapes, ornate calligraphy and flower-filled pots decorating the decks. I find seasoned mariner Andrew Watts busy adding spit and polish to his 18m narrow boat The Anna. He’s sailed to London from Penkridge in the country’s far north, a trip that took a fortnight. “I’ll probably take much longer to get back,” he tells me while applying a new coat of paint to his boat’s coal stove flue. Timeless tinkering is an essential part of life aboard a canal boat. Anther hallmark of owners is an unbridled enthusiasm for matters traditional. “Much of the ornate decoratif seen on narrow boats dates back to the 17th Century,” Watts says, then shows me the tiny boatswain’s compartment lovingly recreated in period style, each wooden panel painted with a wildly colourful scene in miniature. A couple from Cumbria are moored in nearby Paddington Arm. On board they have a fitted kitchen, bunks, comfortable armchairs, a dining table, a bar and a TV. They’re able to moor their quaint little home for 14 days at no charge, making it the best and cheapest way for them to visit London. “And if we stayed in an expensive hotel we couldn’t bring the dog.” Their terrier’s tail thumps the deck in approval. Information and maps of the area are available from the British Waterways Canal Office in the former toll house beneath Westbourne Terrace bridge, a spot known as “Paddington Stop”. A water bus sails regularly from Little Venice through Regent’s Park to Camden Lock. The Thames Path National Trail follows a route that literally flows through the entire story of England. The Path hugs the country’s most famous river for nearly 300 kilometres from its source in the Cotswolds to the Thames Barrier in London. It’s the only long distance path to follow a river for almost its entire length. I have time enough to hike 100 kms of riverbank, from Abingdon near Oxford to Windsor near London. It’s worth it, however, to simply spend a day along the river, which is what most walkers do. Until the arrival of the railway this river was the country’s most crucial trading route. Much of today’s trail follows tow paths that date from medieval times when barges were hauled either by horse or sheer manpower. Tow paths often switch between opposite river banks, indicating where owners had denied access to their land. 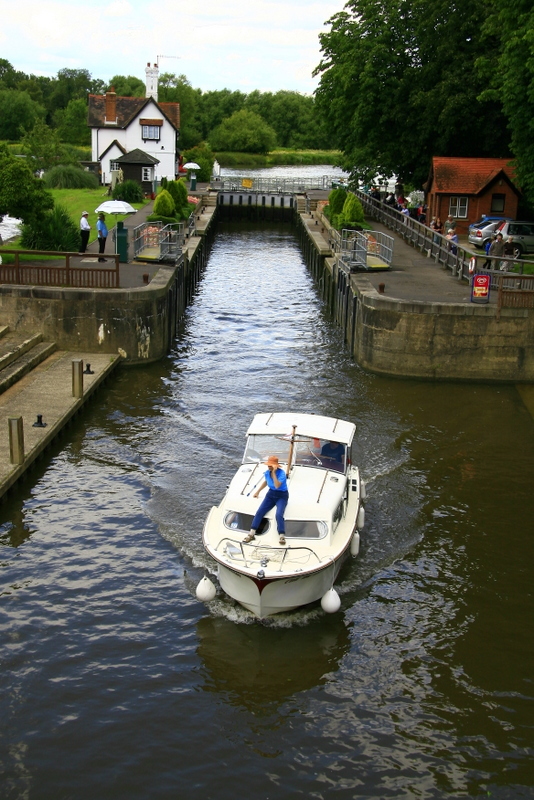 Many locks along the river add to the overall charm of this quintessentially English adventure. 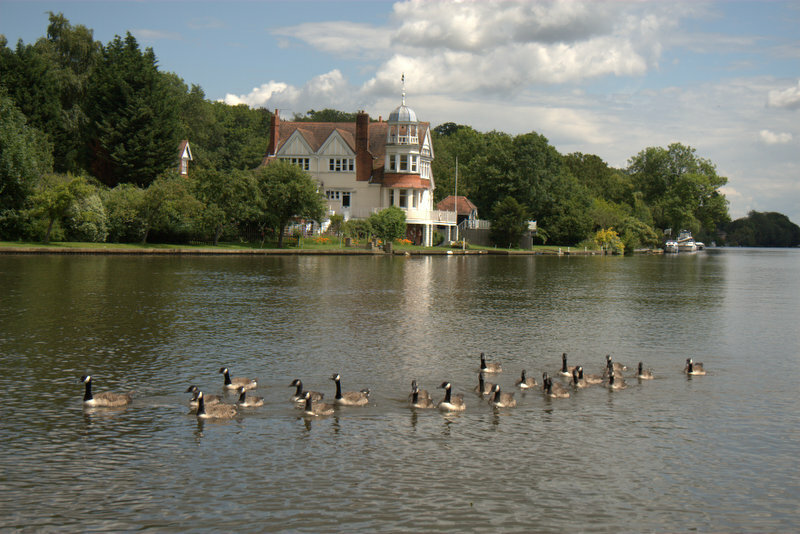 The Thames can be very busy in fine weather, even more so at weekends, and is especially busy during special events like the Henley Regatta each July. It’s generally best to book in advance if you plan a sit-down meal at a pub, cafe or restaurant beside the water. The same rule applies to accommodation along the river. 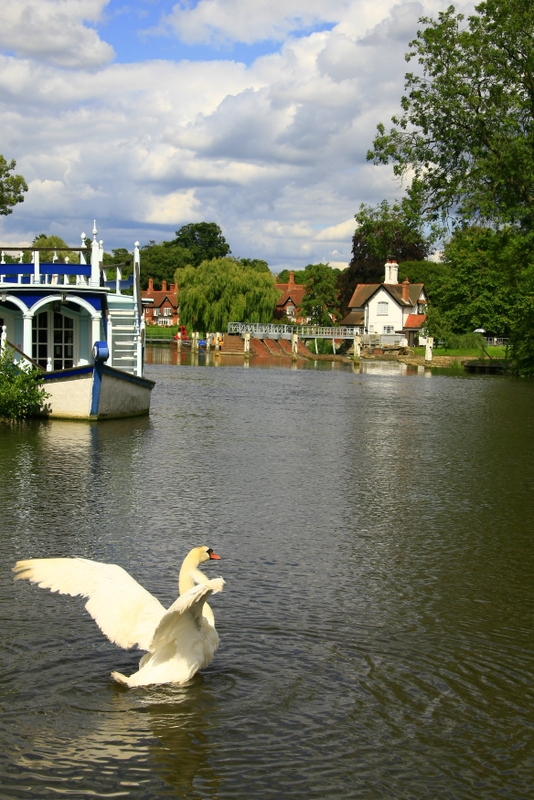 Between the lovely villages of Goring and Streatley the river forms the boundary between Oxfordshire and West Berkshire. The Bull Inn in Streatley features in Jerome K. Jerome’s Three Men in Boat. The main characters and their dog visit it “much to Montmerency’s satisfaction”. You should probably do the same. The Goring Gap, where the river flows between the hills of the Berkshire Downs and the Chilterns, is the narrowest part of the Thames Valley. Towards Pangbourne and Purley I’m strolling through Wind in the Willows countryside and can imagine Mole and Ratty huddled deep in the riverbank muttering about the thud of boots overhead. The trail climbs a gentle incline through woods filled with birdsong before snaking across open meadowland filled with wild flowers with wonderful names like oxe-eye daisies, cuckoo flower and meadow cranesbill. Ducks flutter in the reeds, dragonflies dart above the surface of water and there’s a heron perched on the prow of a small boat. On the opposite bank stands a magnificent home. England most truly is a green and pleasant land. The Thames Path is not always this pretty. A stretch near Purley is particularly dismal because after Mapledurham Lock there’s a housing estate blocking the waterside trail. I have to walk uphill through a huddle of boring bungalows and almost miss seeing the sign that directs me back, across the railway line and down the slope, to regain the riverside. Seeing that Thames tow paths have existed for centuries, I think it’s outrageous that a private commercial development was allowed to curtail access to the river bank. 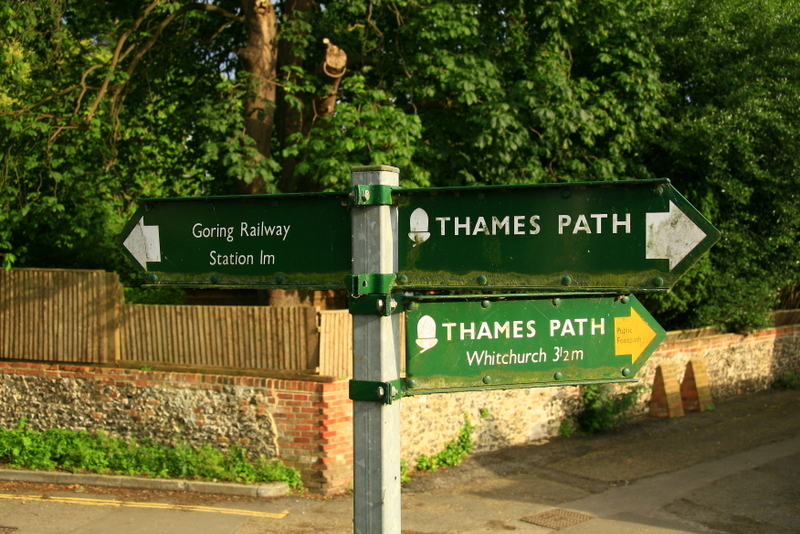 The Thames Path is primarily for walkers although there are a few short stretches, mostly in the London area, that are also open to cyclists. The Path is divided into 15 sections of 14 to 27 kilometres in length. In most instances the walking is not that strenuous and therefore suitable for all ages. The Path is open all year, weather permitting, and is accessible from most parts of the country using public transport. Most users are day walkers. All you need are comfortable walking shoes, a small pack for food and water, seasonal clothing and train tickets to your chosen departure point. The official site for the Thames Path has an amazing amount of pertinent information, including accommodation options. The Thames Path Companion (available from Amazon) is the essential guide to accommodation, facilities and services. VisitThames lists the locks along the river and has information on activities, eating and accommodation.